Our gift to you as the season of giving approaches: two treasures we’re loving right now. While #teamPARTNER are experts at customer experience, we are also experts in something else: New York City. Whether born and raised here or avid explorers, we are constantly searching for experiential (new & slightly hidden) treasures in this city. What are we currently excited about? Retail restaurants, because shopping and eating are two of our favorite things! 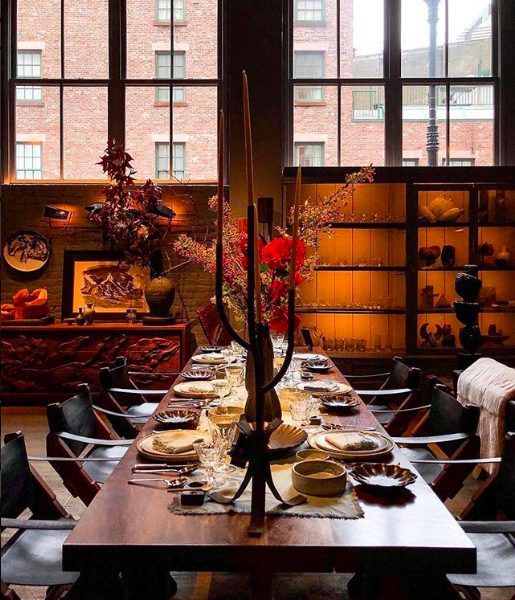 Tucked into interior design powerhouse Roman & Williams Guild (photo above), and a few blocks from our office, you will find the La Franc table (top photo) at La Mercerie. Smooth leather, bright wood, and custom florals adorn this 6-8 person table available for a one-of-a-kind dining experience. While this isn’t a private room, you will feel a world away from the restaurant 30 feet away. A designated server will oversee your experience in the heart of this design sanctuary while enjoying elevated French café fare from celebrated Chef Marie-Aude Rose. Did we mention everything on your table is available for purchase (photo below)? Talk about #dinnergoals! Perched atop a 6 story glass, steel and brick structure, RH Rooftop Restaurant is an oasis in the Meatpacking district (housed in the former Pastis space) and a collaboration with the furniture store formerly known as Restoration Hardware. 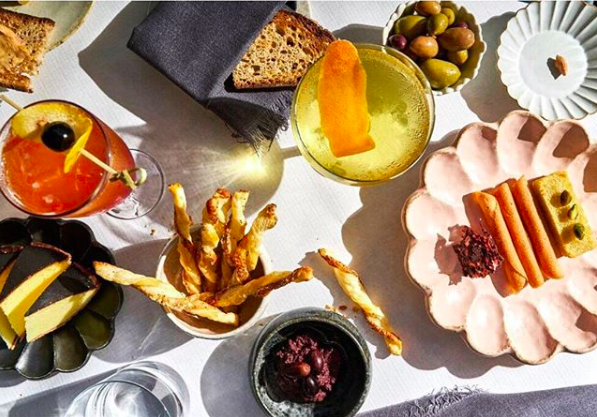 This new rooftop restaurant offers a "seasonal, ingredient-driven menu". As one would expect from the luxe furniture store, the restaurant is adorned with manicured shrubbery, crystal chandeliers and elegant furniture (photo below). Did we mention there is a wine terrace with striking views of downtown Manhattan? Unlike at La Mercerie however, none of the furniture is for sale at RH Rooftop. We want to hear from you, what are your favorite experiential treasures in your city? !